Well made, but still steams up. The Arai Axces 3 is a typical well built, strong Arai design that shows significant evolution from the Axces 2. The vents are better, but the visor does still steam up very easily, even in early Autumn. It definitely needs a Pinlock inner visor and the standard visor features a recess in the screen which makes the Pinlock fit better and cleaner. It would be nice if the Pinlock was supplied with the helmet. The helmet is light but very strong compared to cheaper lids and is also pretty quiet, although there is a new whistle sound compared to the older Axces 2. As always with Arai, the helmet looks aesthetically, very, very good, although the straps could be longer. Comfort is good but of course mine needs to bed in, so it's still slightly tight. It seems that you either have an Arai head or a Shoei head - I definitely have an Arai head! Great helmet. Fits like a long lost friend. Still a little noisy to be honest, but would recommend for people who want a top quality helmet at an affordable price. I bought this helmet to replace an Axces 2 which I liked a lot. The 3 is even better. Its light, quiet and feels very comfortable - the lining is soft and ventilation is just right. The visor locks down well for motorway / high speed use. It feels a high quality helmet when you wear it. 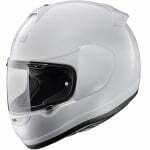 It's also great value for money compared to other brands, and to other Arai helmets too. Perfect fit, very comfortable and light, no buffeting and quiet, definitely the best helmet I've had and at a good price for a top brand. I have an oval head and this helmet fits beautifully. It pulls on cleanly without ripping my ears off and yet once on feels snug, coddling. The lining material is soft with a very pleasant feel. It is a light helmet unfortunately I don't know the weight but it is lighter than my Sharp 900 and considerably quieter. Issues? When the visor is pulled own and latched I find it difficult to unlatch it when wearing gloves. It doesn't have a breath guard but the ventilation is such that it doesn't require one. Speaking of vents, there are a lot and the helmet is cool on the warmest of (UK) days. I recommend you give this helmet a try if you're looking for one in the medium price range. It fits my head like it was made for me. Easy to put on and take off. Soft inside. Very quiet. Light. Awesome. The successor to the Arai Axces II, the Axces III is constructed from a super fibre (SFC) outer shell and incorporates the proven wide-screen SAI aperture opening. The Axces-III also features a superb airflow system which doesn't compromise the outer shell. If there's one brand you can rely on in the fast moving world of motorcycling, it's Arai. Since 1937, this family owned company has committed itself to one goal, making the very best helmet possible. Arai have consistently provided the ultimate in motorcycle helmet safety, comfort and quality thanks to over 20 years of effort in MotoGP, World Superbike and every other conceivable form of motorcycle racing, at all levels. Every single piece of knowledge learned on the racetrack is put to good use in the development of product, helping to protect every one of Arai's customers on the road, the world over. There truly is no such thing as a cheap Arai helmet. So while many things change, one truth will always remain. If you want the ultimate motorcycle crash helmet there is only one choice, Arai Helmets. Hi does the access3 in xs use the same shell size as the small but with extra padding? Our supplier have confirmed that the XS and Small Helmets share the same helmet shell. Therefore the XS must have thicker cheek pads (crown is not removable and identical in all Axces 3 Helmets).